Here in Minnesota, we’re always hoping for that one last round of golf before the snow flies — and this season we were still playing into November. As a result, we might put off cleaning our golf clubs, and once the snow starts falling we forget about that job and store them for the winter. (Writing this story reminded me about my neglected sticks.) So here are a few tips on how to clean your clubs and put them away for the offseason x(or at least until it’s time to jump on the plane and head south). Golf clubs should indeed be cleaned after every round to protect the clubs and help extend their life. Some tidying up during the round is fine, but if we are putting them away for the season, we should give them a deep cleaning. It will give you the opportunity to see how they came through the season (checking for anything in need of repair or replacement), and you can be ready to go when you start next season. The most common suggestion is to use some warm (not hot) water with a bit of dish soap. Use a wet towel to clean them and be sure not to dunk the club heads into the water. A plastic brush, even a toothbrush, is a safe way to go (but I have found that the wire brush is quicker and more effective). I also use toothpicks for digging out those remnants of your last few divots. Always wipe the club heads dry after the cleaning, so as to not promote any rust during the offseason. You should also clean the grips of the clubs, and a little Dawn dish detergent is recommended to remove any body oils that may have built up on them. You can also give those grips a good look over at this time to see if any need replacing (the short irons, due to practice and more frequent use during a round are usually the first to go). After cleaning the clubs, I look through the pockets of my golf bag to see what detritus is being stored there that I might have forgotten. There are usually too many pencils, nicked up golf balls I found that I know I won’t use, extra ball mark tools, or ball markers that create more weight, and even that tattered Rules of Golf book we all carry that is going to be replaced by the new Rules book coming at the beginning of next year — all of these items can go. Then place your head covers on the clubs, and you can even attach the rain cover to keep excess dust off the clubs. Then find a good place to store them for the winter. 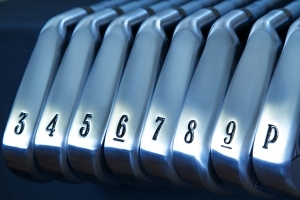 The key is to find some place that is temperature controlled, because the fluctuations in temperature can affect the life and performance of your golf club shafts. That means don’t leave them in the trunk of your car (even if you are planning a road trip to a southern climate) or in your unheated garage. Your spouse may not appreciate your golf clubs adorning the corner of your bedroom for about five months, so maybe the closet in your home office will suffice. Anywhere you have easy access to the putter for offseason practice. None of this advice is groundbreaking, you probably do plenty of it already, but it is important to extend the life and performance of your golf clubs. Replacement clubs are expensive, especially if your bag is filled with those “Billy Beroo”-type clubs that are always dependable and difficult to part with. Keep Billy clean and protected like Judge Smails did in “Caddyshack,” and it will never let you down. Everybody loves new golf gadgets and gear, and our Explore Minnesota Golf Alliance teaching pros are no exception, so we asked them to help put together a winter wish list of great golf gifts.